After four rounds, including three head-to-head bracket rounds and six weeks of social media competition, MDG Advertising emerges as the winner in the South Florida Social Madness Challenge. MDG now advances to the national rounds. 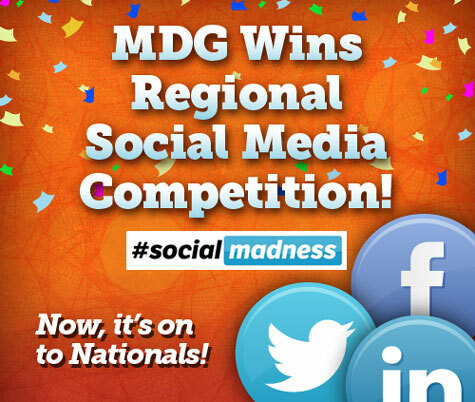 (Business Wire) Boca Raton, Fla. – July 22, 2012 – MDG Advertising, a full-service Florida advertising agency with offices in Boca Raton and New York City, today announced a first-place win in The Business Journal’s South Florida Social Madness Challenge. This one-of-a-kind corporate media challenge measures the growth of a company’s social presence. The agency won all four rounds in the competition’s “small company” category, defined as from one to 99 employees, in scoring that took place from June 1 through July 16. Scores were tallied based on a company’s growth on Facebook, Twitter, and LinkedIn, as well as votes on the Social Madness website. Beyond winning in its category, MDG placed higher than all medium-sized companies and higher than every large company, with the exception of Norwegian Cruise Line. MDG now moves on to the national competition, taking place from July 24 through September 10. The winner of this next level will have $10,000 donated to the charity of their choice. To keep in the spirit of being social, MDG is allowing its supporters to help choose the winning charity. Founded in 1999, MDG Advertising has established a leading reputation for developing targeted and integrated 360° marketing solutions. The agency’s fast growth directly results from its solid branding and media-buying strategies, award-winning creative, innovative Web design and development, as well as effective digital and social media marketing. The list of those benefiting from a competitive advantage developed by MDG includes: The Breakers Palm Beach, Dental Care Alliance, IBM Southeast Employees’ Federal Credit Union, The Seagate Hotel and Spa, Carls Patio, Brain Balance Achievement Centers, Boca Raton Museum of Art, South Florida Fair, MDVIP, Round Hill Hotel and Villas, TooJay’s Gourmet Deli, Upfront Foods, Signature Consultants, World Fuel Services, Benetrends, Max Planck Florida Institute and HCA East Florida. For more information about MDG Advertising, please visit mdgadvertising.com.